The fun and funky sock set perfect for your budding style icon. Elasticized top hem. 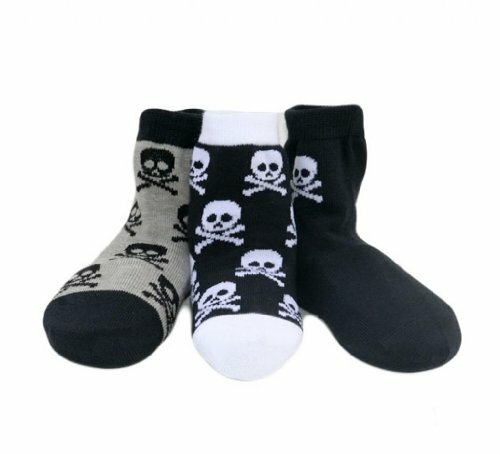 Cap toe socks with a skull print throughout. A fashionable choice for a fun print sock selection! In a market that is notoriously limited for boys clothing, Born to Love has created a line that moms and kids will love and dads will envy. Founded in 2007, Born To Love Clothing caters to parents who are looking for chic fashion clothing and accessories for their babies, toddlers and youngsters. We specialise in baby and kids headwear and we have created a variety of hats such as fedoras, newsboy caps, ivy caps, driver caps, gatsby caps, golf caps, cabbie caps, knitted beanies, ring bearer and page boy caps but recently expanded our collection which now includes bow ties, suspenders, socks and shirts. Looking for a birthday gift, a baby shower present, a trendy photo prop or new accessory for your children's wardrobe? Our range includes items for every season and occasion, for kids of any age, from every day wear to special events accessories. Make sure you check back often for more styles and colours by Born to Love Clothing! Fashionable & Comfortable. A perfect baby shower gift!